5 Realms of Cards is nothing like an ordinary solitaire game - it's visually nice, story-driven and with an all-new and addictive game mechanic. Explore over 70 levels to help a young princess named Jokerine restore peace and beauty in card realms and learn a secret! Use cool bonuses to make your way through 5 unique card realms. Play 5 card-based mini-games and explore a beautifully rendered world in 5 Realms of Cards. 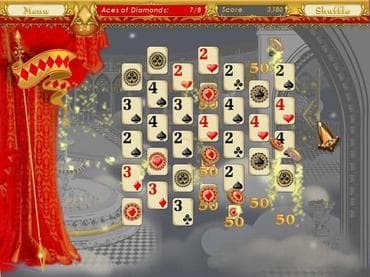 Download free full version game today, go through 5 Realms of Cards with 72 levels full of addictive solitaire playing fun and enjoy! If you have questions about 5 Realms of Cards game, please contact us using this form.